Blogging a little at a time! : Monday---BLAH!!!! BLAH BLAH BLA!! That is all I can say. But tomorrow is Tuesday and well on our way into the week. Can anyone tell that I am not a fan of Mondays? Tomorrow is a big day for me. We are moving (AGAIN!!!) so I will be out for a couple of days. This is the second move within 5 months. How do I do it? Who flippin' knows!! Hubby wanted to move closer to work and he usually gets what he wants so here we go again! I will be out for a couple of days as my internet won't get hooked up until next week. Can you believe that CRAP?? How will I survive? My poor computer will be away from it's mommy. Anyway, this past Friday there was no Freebie :( I just couldn't get to it BUT to make up for it I have one for ya NOW. 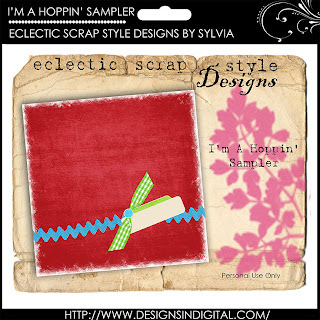 It is a Sampler from my I'm A Hoppin' (Hoppy Easter) Kit. You can grab it over at Designs In Digital and A Cherry On Top.